The first stage in creating a backup strategy that enables you to restore your PC following a major system crash is to get Windows up and running as quickly as possible, for this we need to create an Emergency Backup Job. Windows NT, 2000 and XP. The current version of AISBackup does not support the Emergency Backup Job in Windows NT, 2000 or XP. This does not mean that you cannot make a disaster recovery backup, it just means the restore process takes a little bit longer. Jump part 2, Securing the 'C' drive. The Emergency System Backup is designed to get your system up and running to a state where you can perform a proper restore using your regular C: drive backup. The Emergency System Backup need only be created once per PC and then re-created only after major hardware changes such as adding a new CD writer, new CD writer software. You can even restore Windows ME from an Emergency System Backup made on Windows 98! If you are in the habit of re-building your Operating System on a regular basis then you may want to make an Emergency System Backup based on the whole of the C: drive rather than the minimum required to get Windows running, here you are the best judge as to when you re-create the Emergency System Backup. If possible try and get hold of a spare disk that you can temporarily replace your existing C: drive with in order to familiarise yourself with the Emergency Backup Restore procedure. An emergency backup job is used to create a backup that is suitable to restore the Windows Operating system to a PC that has had the hard drive reformatted or replaced. The emergency backup must be written to the hard drive initially, this is because a CD must be created as a Joliet encoded CD so that it can be read from the DOS operating system. The integrated AISBackup CD Writer creates CD's in this format. AISBackup does not restrict where a backup is located, but Emergency System Backup�s cannot be written to folders that are already in-use. Regardless of where you create the backup you will require your Windows Start-up diskette, this is especially important if you are running Windows ME, because you cannot boot Windows ME into DOS. The Windows Start-up Diskette should also be updated with AISBackup menu options to help with the restore process. Setting up the Emergency Restore diskette (also known as the Windows Start-up diskette) with the AISBackup menu options will cause AISBackup to create a bootable disk image. The disk image is used by the AISBackup Integrated CD Writer to create bootable Emergency Backup CD's automatically. If you have backed up your system to a network drive you will also need DOS mode network drivers to map to this drive in order to restore your operating system. See your Network Administrator. The creation of an restore diskette is not straightforward for Windows 95 users because you have to supply and set-up your own CD-ROM drivers. A Windows ME restore diskette can be used to restore from an AISBackup Emergency System Backup. If you require to use 'FDisk' and 'Format' to set up your hard drive be sure to use a set-up appropriate to the version of Windows 95 you are using, i.e. only use FAT16 for Windows 95 OSR1 (The restore will work with FAT32 but Windows 95 will not run!). 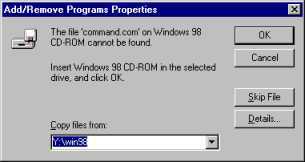 When formatting the hard drive using a Windows 98 diskette do not use the /S option, AISBackup will restore the correct boot files. The contents of a Windows ME boot diskette can be downloaded here. (Or a friend may want to keep a secure offsite copy of their own Windows ME boot diskette in your house). On the Task bar, select Start, Settings, Control Panel. If requested, load the Widows CD ROM Then Click OK. If appropriate locate the Windows Install files, see below, then click OK. If you haven't already, insert a floppy diskette when requested, then click OK. Copy smartdrv.exe to the Windows Restore Diskette. Once the diskette has been created you should add the AISBackup menu options to it. The following provides step by step instructions for creating the Emergency Backup Job. Select Emergency System Backup then click Next. Type ESB as the name of the Job, it is recommended that you leave Test Backup selected. Review the Backup Destination, this will normally be left as the generated value. The folder names must not exceed 8 characters because AISBackup assumes you may want to access these files from a DOS session, even though you may be going to 'Master' them on a CD. click Next. AISBackup will now select the operating system files and CD Packet Writing system files, if appropriate. If your regular backups have been written to CD using a Packet Writing system that has not been recognised by AISBackup then you must select your CD writer software manually. Remember the Emergency System Backup is only designed to get your system up and running, you regular C drive backup contains the up-to-date versions of the above folders. Select the CD packet writing software if AISBackup has not automatically selected it. 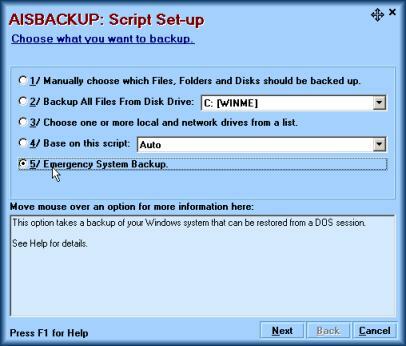 To run the backup now click Run to defer the backup click OK please see online help for the More options, press F1. If you have enabled the AISBackup CD Writer you may still elect to create a CD using a third party CD Writer, see below. Select Yes to use a third party CD Writer, No to use the integrated AISBackup CD Writer. Creating the Emergency Backup CD. Creating the Full C Drive Backup.